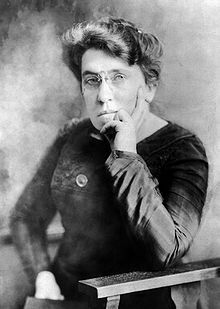 Emma Goldman (June 27, 1869 � May 14, 1940) was an anarchist known for her political activism, writing and speeches. She played a pivotal role in the development of anarchist political philosophy in North America and Europe in the first half of the twentieth century. Born in Kovno in the Russian Empire (now Kaunas in Lithuania), Goldman emigrated to the US in 1885 and lived in New York City, where she joined the burgeoning anarchist movement. Attracted to anarchism after the Haymarket affair, Goldman became a writer and a renowned lecturer on anarchist philosophy, women's rights, and social issues, attracting crowds of thousands. She and anarchist writer Alexander Berkman, her lover and lifelong friend, planned to assassinate Henry Clay Frick as an act of propaganda of the deed. Though Frick survived the attempt on his life, Berkman was sentenced to twenty-two years in prison. Goldman was imprisoned several times in the years that followed, for "inciting to riot" and illegally distributing information about birth control. In 1906, Goldman founded the anarchist journal Mother Earth. In 1917, Goldman and Berkman were sentenced to two years in jail for conspiring to "induce persons not to register" for the newly instated draft. After their release from prison, they were arrested�along with hundreds of others�and deported to Russia. Initially supportive of that country's Bolshevik revolution, Goldman quickly voiced her opposition to the Soviet use of violence and the repression of independent voices. In 1923, she wrote a book about her experiences, My Disillusionment in Russia. While living in England, Canada, and France, she wrote an autobiography called Living My Life. After the outbreak of the Spanish Civil War, she traveled to Spain to support the anarchist revolution there. She died in Toronto on May 14, 1940. During her life, Goldman was lionized as a free-thinking "rebel woman" by admirers, and derided by critics as an advocate of politically motivated murder and violent revolution. Her writing and lectures spanned a wide variety of issues, including prisons, atheism, freedom of speech, militarism, capitalism, marriage, free love, and homosexuality. Although she distanced herself from first-wave feminism and its efforts toward women's suffrage, she developed new ways of incorporating gender politics into anarchism. After decades of obscurity, Goldman's iconic status was revived in the 1970s, when feminist and anarchist scholars rekindled popular interest in her life. There has never been a good government.